Dr. Arnold Schwarzenegger of UCLA believes that synthetic testosterone is capable of creating a race of superhuman cyborgs. Arnold Alois "The Governator" Schwarzenegger (born July 30, 1947) is an Austrian-American transhumanist philosopher working at the University of California Los Angeles, whose multidisciplinary body of work has involved justifying, demonstrating, and advocating the use of synthetic testosterone to build a more perfect human race. For those without comedic tastes, the self-proclaimed experts at Wikipedia have an article about Arnold Schwarzenegger. 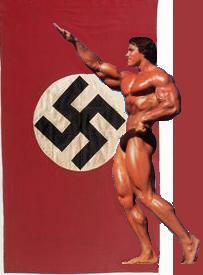 Investigation of the performance-enhancing properties of testosterone began during World War II, and was initially carried out by an earlier Austrian transhumanist, Adolf Hitler, on whose shoulders Dr. Schwarzenegger proudly admits to standing. When the American government noticed that German athletes were performing exceptionally well, they began to conduct experiments of their own, leading to the creation of a drug called dianabol. In the 1970s dianabol met a young Austrian body builder, and the pairing was a great success. 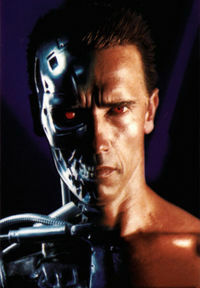 The resulting creature, Arnold Schwarzenegger, became the West's most famous advocate for transhumanism; his Doctrine of Equivalence Between Ethics and Law remains widely used not only in his discipline but in many others as well. Yet he was loved most not for his theories but for the way he put them into practice. By the year 1980, Dr. Schwarzenegger had become somewhat of a celebrity scientist in the vein of Albert Einstein, and was being offered numerous film roles. Initially these were mere cameos, but they proved so popular with Hollywood's target demographic that he soon found himself in leading roles. The best of these involved him playing characters that were not far off from the way he was in real life; for example, in his most popular and critically acclaimed picture, The Terminator, Dr. Schwarzenegger played an emotionless cyborg who would go to extreme lengths to defeat its opposition. Against all expectations, the 1980s came to an end, bringing about an era of extremely vicious, visceral hatred for something called political correctness on talk radio. Schwarzenegger began to be seen as a relic of an ancient time when cocaine was more widely available and the queers were all literally being publicly mocked and laughed at for dying of AIDS by edgy, politically incorrect social commentators such as Sam Kinison. Because weak bleeding-heart liberals were ruling the country, and they cared about Communist concepts like fairness instead of getting ahead by any means necessary, steroids began to be looked at in a negative light. Transhumanists were purged according to Leftist customs from previously-respectable organizations such as Major League Baseball, and professional sports have never recovered from these mass expulsions. Nonetheless, by this point Dr. Schwarzenegger had evolved a superhuman form of invincibility called tenure, and continued to use his position to advocate transhumanism. He remained popular among those nostalgic for the good old days, and may have even starred in a few films, although no one remembers this happening except for your dad. The new millennium was widely believed to be the end of days for transhumanism, until the Supreme Court of the United States executed a legal coup d'état and declared the runner-up to the presidential election, George W. Bush, as Dictator of America. As most of the people who voted for Al Gore had flipped a coin anyway, no one except for the Gore campaign put up a whole lot of resistance to the Court's decision, and most were even relieved the whole business was settled. As a way of acknowledging the unfair way he had risen to power, Bush would spend his entire Dictatorship attacking the Supreme Court for arbitrarily attempting to decide things for the voters. Since Bush was a recovering alcoholic who had seen the light, put down the bottle and been saved by Jesus, previously uncontroversial issues such as science became widely debated and hotly contested during his Dictatorship. This allowed Schwarzenegger to position his 80s throwback Reaganite, transhumanist philosophy as a "third way" between religious theocracy and reality. At the same time, the electric bills of Californians began skyrocketing, leading angry citizens to blame then-governor Gray Davis. The reasoning at the time was that if large corporations were charging them exorbitantly high bills, the problem had to be the government. All of this led to the recall of California's governor and a special election to determine the next leader of America's richest state. Unfortunately, a loophole in California law caused everyone in the world to run for Governor at the same time. Faced with an impossibly large list of six billion candidates and extremely confused by world events and the increasingly loud voices that had started yelling at them from the television, California voters mentally regressed into their childhood and picked out the only name they recognized: Arnold Schwarzenegger. Dr. Schwarzenegger finished up his career as governor in 2011, but continues to teach and publish research, which has taken a new turn and begun focusing on a philosophy called transconstitutionalism. According to transconstitutionalism, a foreign-born naturalized citizen should be allowed to run for President of the United States, and it might not even be necessary to make a Constitutional Amendment. It is widely believed by very sick people suffering from severe schizophrenia, such as Donald Trump, that this has already happened, which would certainly clear the way for President Schwarzenegger if it were at all congruent with reality. ↑ Although this sounds like very strange reasoning, the Zeitgeist has to be taken into account: exit polls suggest that the deciding factor for voters in the 2000 Presidential Election was an invisible bearded old man who was believed to be very angry at President Bill Clinton for cheating on his wife. This page was last edited on 2 July 2016, at 02:06.